In 2001, during the famed Pushkar fair in Rajasthan, Bagdiramji, a leader of the Raika community, summoned us to the Ram Raika Mandir. " Thousands of female camels have been bought for slaughter in Uttar Pradesh and other places. This must be stopped," he pleaded. The Raika leader's request left us stunned. We had been researching on, and working with this community of camel breeders for the past 10 years. On numerous occasions, the Raikas had related us how the Hindu deity, Shiva had entrusted the care of the camel to this community. The idea of using camels for meat was absolutely abhorrent to the Raikas. This sentiment also manifested in a letter that Bagdiramji drafted the night of our meeting. A dozen other members of his community signed the missive. "We are animal breeders, and selling female camels means the end of our livelihood. These animals are like our children; we should not sell them." At the Raika leader's request, we mailed this testimony to half a dozen authorities -- but there was no response. Two years passed by. By 2003, the clandestine meat trading at the Pushkar fair had become an open affair some meat traders even taunted the camel herders with the prospect of finishing off Rajasthan's camel population within the next 10 years. The fortunes of these traders were on upswing: camel prices had risen significantly and a reasonable working camel could be sold for Rs 20,000. Of course, this was good for the breeders as well. But not for the poor people who mada living from their humble camel carts. However, nobody, except the Raika, seemed to take notice or care. 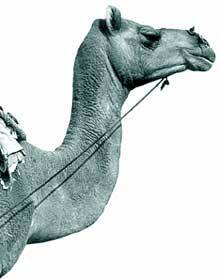 The situation compelled action: we thought it best to conduct a household camel survey in two tehsils of Rajasthan's Pali district in 2004 -- we had conducted a similar exercise in 1995. The results were catastrophic: camel populations had plummeted by almost 50 per cent since our last survey. The Union government's livestock census figures of Rajasthan, 2003 confirmed our worst fears. The state's camel population had nose-dived: from 756,088 in 1992 to 498,000 in 2003. In late 2004, we organised a workshop, which bought together camel breeders from all over Rajasthan. We also organised an international conference where experts from six countries presented examples of what had been done elsewhere to conserve and make economic use of camels (see box: So say the experts). We could only think of one another initiative: a journey on camel back, a camel yatra. In January 2005, we assembled a team of 12 people -- six of them Raikas -- and five camels. Our team would traverse the length of Rajasthan, from south to north, talk to people, inform them of the declining camel numbers and also ascertain their views. The comments were to be recorded in a traditional red diary. A two-wheeled camel cart carried our luggage and thousands of pamphlets and calendars in the local language. Sadri to Pachpadra January, 14, 2005 The night before our departure, Tolaramji, a Bhopa (bard) from Jodhpur, regales us with the story of Pabuji, the legendary Rajput warrior who is said to have brought the camel to Rajasthan from "Lanka", about 700 years ago. Even today, Raikas in Rajasthan's Marwar area seek their legendary hero's help during any calamity, especially those relating to one's camels. Alsipura-Bali January, 15. Hundreds of people, including Bagdiramji and other Raika leaders accompany us initially. Our giant-caterpillar shaped caravan is greeted with frenzied drumbeats at every village, garlanded and blessed by local people. In the afternoon, most of the Raika leaders return back to their villagers. After Mundara village, our retinue is down to about 20 people and 12 camels. We are in Godwar area -- a major part of it has been converted to the Kumbhalgarh sanctuary. Godwar was once famed for its fertility, but the fields here have gone fallow since the last eight years or so. Numerous deep wells have played havoc with the region's groundwater. But, the fallow lands should be good news for camel and sheep herders; it could serve as pasture grounds for their livestock. But that has not happened. For, no grazing permits have been issued in the Kumbhalgarh sanctuary, since 2004 - this deprives animal herders of their summer grazing grounds. January, 16 Our first stop at the district is Dhani village, home to a large number of itinerant Raika herdsmen. The sarpanch (village head) notes his people's complaints in our diary: "There is no grazing land for our camels. The (Kumbhalgarh) sanctuary must be opened up. Moreover, angrezi babool (Prosopis juliflora) proliferates all over and spoils our soil. It must be eradicated by the root. " Pane Singh Rajput at nearby Kenpur village makes a similar entry, " Trees such as neem, orabjia, khejri and ber have become very few; there is neither green food nor dry feed. The pasturelands have disappeared and so have the people. Pastoralism might still be a source of livelihoods, if the government supports animal breeders. Grazing charges should be reduced." At Chanod village, the Raika explain: "Our animals have grazed the area now called Kumbhalgarh sanctuary for more than 40 years. But when Village Forest Protection Committees were established in the year 2000, the area was declared out of bounds for our animals. Since then, we had no place to go during the rainy season, many of our camels have died and we have sold off quite a few. Once there were around 2,000 camels in Chanod, only 70 of them are left. Camel breeders are among the poorest in the area and their children have to move out of the village for petty jobs. Soon you might not see any camel at all." We see no camel for the next couple of days -- except ours. Autorickshaws rattle their way through the villages. In Samderi, the Raika make a note in our diary: "The gochar (pasture land) has been taken away by the government. Many of our camels have died and some were sold off. There are less than 50 of these animals in our village. Many camel-breeders have to labour in the cities." The story is repeated in Parlu and then again in Hotlu where we stay overnight in a temple compound. January, 22 We have a day's rest and explore the salt mines close by while our Raika companions go out for a shave. The water would be salty in the stretch ahead, so we gear ourselves: large jerry cans are purchased and filled with sweet water. January, 23 We head straight north, making constant enquiries along the route -- our map is not very informative. We traverse an extended sand dune area. In village Saijiali, Padam Singh comments: "Everybody here used camels to plough our fields, draw water, and pull carts. But now machines do all such work; besides there is a lack of feed for camels. " A few miles later, we pass a Raika hamlet, where a red festoon on the entrance gate indicates wedding festivities. We are invited to partake in the feasting. Discussions inexorably turn to the declining camel numbers: 200 female camels in the village, down from 500 animals, ten years ago. Our retinue then moves towards Falsunt and then Rajmathai villages. The winding and sandy track rugged terrain of the Arravalis now gives way to a newly paved straight road. Barbed wires on both sides protect mustard fields. The lush yellow fields do seem pretty, but the barbed wires leave nothing for our camels to nosh on during breaks. We stop over at a tea-stall in Rajmathai. People at the shop nod politely when we tell them of our mission, but one man who joins the crowd a bit later, suddenly bursts forth: "You are right: we have to save the camel. But just tell me, how do we do that? There is absolutely no place here to graze. So how can I keep a camel?" It strikes us then that telling people to keep camels in an irrigated area is probably a bit like telling people in a famine struck area to eat more. January, 26 The irrigated fields continue to flank the road, till we turn right onto a kaccha path and are again among the sand dunes. The atmosphere immediately changes and we feel like lords of the desert. We camp in the middle of the wilderness under the stars. Even Laxmi who had been quite for most of our journey, goes into raptures about the sparkling beauty above us. January, 27 We have almost run out of water supplies and have no milk, so push off without tea. The next settlement Meeraja, looks deserted from a far, but we are in luck. A local family responds to our request for milk with overwhelming warmth. Tolaramji reciprocates their kindness with a song and dance. This attracts the local Mirasi (jester) and a group of schoolboys also join in to the spontaneous concert. The tea arrives, all in all a splendid morning. A few kilometers from Meeraja is Achla, a village reputed for its camels of rare quality -- some of the animals are still in the service of erstwhile ruler of Jaisalmer. Narayan Ram who had participated in our workshop receives us in great style. We have lunch in a narrow room; the service is quite impeccable. The village has a fine oran (sacred grove where animals are allowed to graze), so there is still a sizeable camel population. But diseases have caused substantial losses, and Narayan pleads with us to help him obtain medicines. January, 30 We are now joined by 25 other camel riders, who accompany us on our rally through Jaisalmer. A few Bhopas, mobilised by Tolaramji add colour to our contingent. We pull out our banners and thread our way along Jaisalmer's ring road, concluding with a loop around the city's famous fort. Numerous media representatives take note of our mission. But our delight is spoilt by the testimonies of the local camel people: there is no camel in a string of North Jaisalmer villages including Mohangarh, Bhala and Nachna. The area was once legendary for its camel stock. But the Indira Gandhi Canal that reached here in the 1990s has cut this camel breeding area into half. Land that previously was common property has become privatised. Camels can no longer roam freely and the cultivators are said to shoot camels with guns or torture them by tying thorny shrubs to their tails to scare them away from their fields. January, 31. We arrive in Hameera, another village known for its camels, just as a barat (wedding-party) is getting ready to depart. Some of the guests enquire about our mission and chip in their opinions. A retired bank official comments that the Border Security Force has almost stopped buying camels. Roads have been built along the border and the animals are not required for patrolling anymore. So, the camel breeders have lost an important source of income. But the bank official also notes that in Gandhinagar district, the camel is making a comeback because some chara (animal feed) is available there now. February, 1 We head towards Pokaran. The high-pitched noises of the military convoys transporting tanks on National Highway no 15 rattle our otherwise placid camels. But there is good news at last. In the area between Pokharan and Jaisalmer, just south of National Highway 15, a good number of camel herds still provide satisfactory returns to their owners. We reach Moderdi, where an elderly Rajput with enormous handlebar moustache tells us that he had earned Rs 200,000 last year by selling the male offspring of his 200 head camel herd. But his children are educated and have little time for camels. February, 5. We rally through Pokharan and head for Kolumand. The village has a famous Pabuji temple and has a huge oran, dedicated to this folk god. The villagers tell us that the government has been trying to fence in the sacred grove, but that the villagers would broach no nonsense about their deity's land. The barbed wires have always been pulled down. This spirited resistance revs up Tolaramji: at night he enthralls us with an enthralling performance on Pabuji's exploits. February, 6 We march our camels to Pabuji temple to seek the legendary hero's blessings for our animals. A white dog attaches himself to our caravan and follows us till the end of our journey. We take the road towards Jambo and camp in the open, on an expanse bereft of any vegetation. In the morning, a local farmer invites us to his farmhouse for tea. There are yellow mustard fields all around. Our host also grows cumin and wheat on his 80 bigha land (about 10 ha). It's high input agriculture using hybrid seeds and chemical fertilisers. Our host's fields are irrigated by a tubewell and ploughed on by two tractors. We wonder if there will be a road from Jambo to Bikaner: for, our map plays truant again and shows only a void. Villagers direct us to a kuccha road where a large numbers of gazelles stroll around without a care in the world. But the tranquillity is soon broken: we notice a young female camel dragging behind a huge shrub tied to its tail with a wire. We try to pursue the animal, in the foolish hope of rescuing it from this torture -- but of course, on our approach the camel takes flight and is soon out of reach. A young camel herder, Babu Lal, invites us to make our night halt at Jambo's Raika dhani . We accept his invitation gratefully -- the sky looks really menacing and a huge sea of sand surrounds us. At night, the Raika note down in our diary: "Earlier we had about 550 camels, only 200 of them survive. Many have perished to mange (a skin disease) and lack of pasturelands has killed quite a few. The forest department has spent a lot of money to fence in the grazing land. The government also has dug a well and enclosed it from four sides by barbed wire. The wire injures the camels when they try to drink at the well and then they develop a kind of "cancer" of the foot. The wound festers: there is no veterinary doctor in this area. There are 20 Raika houses here; all of them keep camels. But we will not keep these animals anymore, because nobody can make a living from camels any more." The next day, a fellow traveller on the track north tells us that 2,000 camels were sold for slaughter at a just concluded local mela (fair).